After a long day of congressional testimony and parsing of said testimony, we could all use a palate cleanser before heading home from the office. And, boy, do we have one, from the unlikeliest of sources. 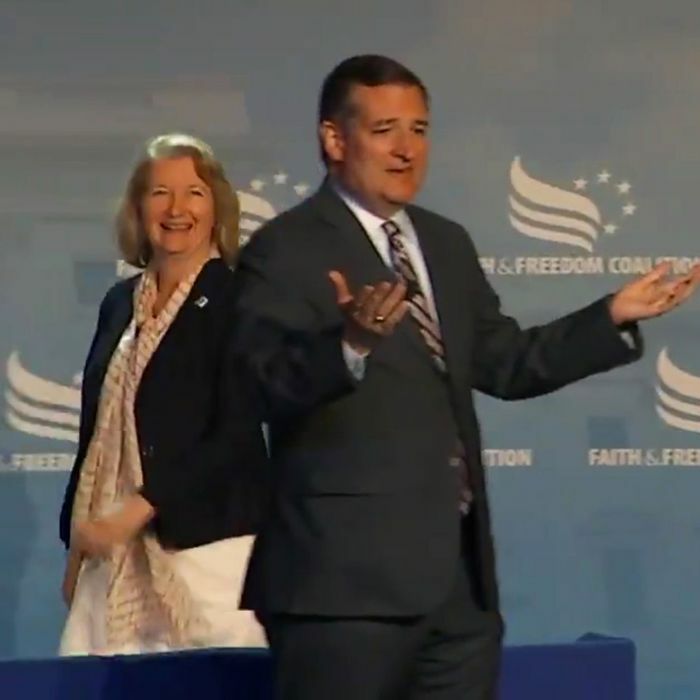 Speaking today at the Faith and Freedom Coalition Conference in Washington, Senator Ted Cruz was played off the stage like a bad ventriloquist on The Gong Show. After throwing up his hands in protest, he slunk away. There’s a chance this was a gag, but we’re hesitant to give Cruz that much credit. More likely, Cruz’s repeated shouts of “thank you” and the crowd’s applause made the emcee think the senator was finished speaking. So the hero grabbed the mic, announced the Faith and Freedom Coalition’s southern regional director, Virginia Galloway, and started playing Cruz’s favorite song.